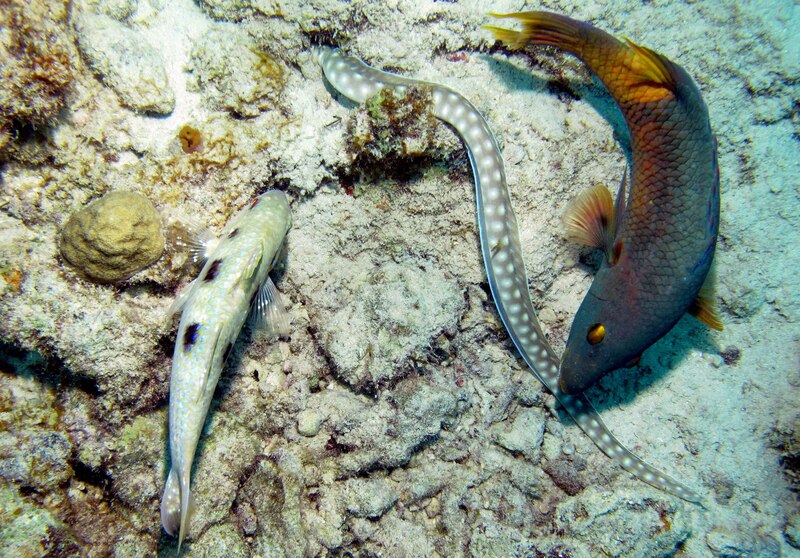 A sharptail eel, a Spanish hogfish and a spotted goatfish walked into a reef. ANIMALS IN THE OCEAN ARE ALWAYS LOOKING FOR FOOD (and trying to avoid being food). Some times it involves more than one animal. On Bonaire, one year, I encountered several instances of group fish hunting. Sort of. There’s a known phenomenon called Nuclear Hunting in which a small eel (like a goldentail moray) and one or more other fishes (like rock hinds) meet up, identify a nearby coral head as a target site and race toward it in one wave. The eel darts into a hole or crevice and the hinds take up stations at exit holes. If it works, either the eel gets a fish inside the crevice or the hinds grab it on the way out. It’s group fish hunting. This appeared to be somewhat the case in two different gangs of sharptail eels, Spanish hogfishes and other fishes. Or it could have just been what might be called Sloppy Seconds Hunting, in which a hunting sharptail was being closely followed by Spanish hogfishes and others hoping to get lucky. In any event, the sharptails were aggressively on the prowl, moving from coralhead to coralhead, sticking their head in one hole or crevice after another. I followed them, too; that’s called Photo Hunting. Sometimes it works. It worked for the Spanish hogfish. In one crevice the eel went in, a little fishy guy popped out the back door – and hogfish scooped it in so quickly I couldn’t even identify the little guy or begin to get a photo. Score one for group fish hunting. 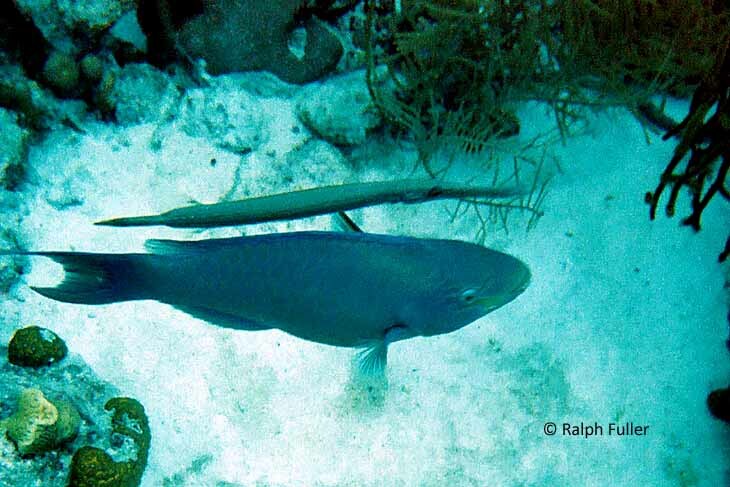 An obnoxious trumpetfish sticks to a parrotfish in the Turks & Caicos. Shadow Hunting is a technique of fish hunting often indulged in by trumpetfishes, who don’t quite attach themselves onto an innocent stooge, like a parrotfish, and hover just above it while they swim around. By shadowing closely, the trumpetfish hides its presence and waits to strike at prey. I’ve always found them hard to photograph because the stooge, already unhappy with being hounded by a trumpetfish, is really spooked by a big, noisy, clumsy diver trying to get close enough for a shot. In this pair, the trumpetfish was driving the stooge (a parrotfish) absolutely nuts and the parrotfish was trying desperately to ignore the whole thing.